RFP-transfected HeLa cells; RFP-transfected 293T lysate. Our Abpromise guarantee covers the use of ab152123 in the following tested applications. WB 1/5000 - 1/20000. Predicted molecular weight: 27 kDa. Immunofluorescence analysis of RFP-transfected HeLa cells labeling RFP with ab152123: (1) RFP is expressed in the tranfected cell, (2) The cell expressing RFP is detected using ab152123 at 1/5000 followed by Alexa Fluor 488 at 1/500 Goat anti-Rabbit IgG, (3) Merged with DNA probe, the lower cell represents a negtive control. Publishing research using ab152123? Please let us know so that we can cite the reference in this datasheet. You show a western blot with a band in the third lane with the size around 50 kDa (same size in the IP western blot image) but "Predicted band size" says "27 kDa". Is this an unspecific band then or is your RFP molecule tagged to another protein? 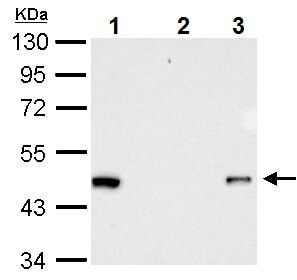 The transfected protein was RFP-tagged, so the molecular weight observed in the WB on the datasheet is the molecular weight of RFP (27 kDa) + the molecular weight of the tagged protein, resulting in a total tagged protein molecular weight of ˜50 kDa. 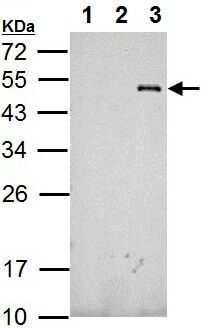 Thus, the indicated band in the western blots on the datasheet is specific.